Call (800) 261-6375 for more information! Are you a highly motivated individual interested in an exciting investment opportunity? Do you want to move quickly into owning your own business, unencumbered by complex franchise operations and offering value at all levels of marketing? Then a CheeZies Pizza franchise may be just the answer for YOU! CheeZies Pizza® is an ultra-simple retail pizza concept, offering high-quality yet low-cost pizzas. 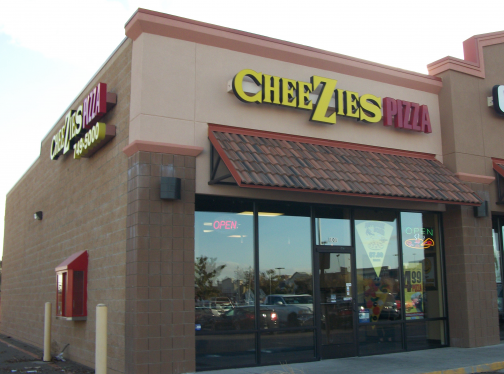 CheeZies Pizza is a unique franchise investment opportunity for entrepreneurs wanting to build a successful business that generates value for investors, managers, employees and consumers, without the complex clutter of traditional pizza franchise operations. Keeps It Simple by focusing on the peak purchasing hours from 3:00 p.m.-10:00 p.m., to eliminate down time. Keeps It Simple by only providing carry-out service, to minimize employee overhead. Keeps It Simple by offering one-size pizza and one crust, to reduce inventory and increase production efficiency. Keeps It Simple by offering a streamlined marketing operation and a competitive product, in a budget-friendly investment range of $123,000 to $547,000. This incredibly simple marketing structure works because CheeZies Pizza® is a subsidiary of SSP Financial L.L.C., the franchise company of the highly successful Simple Simon’s Pizza® franchise concept, which celebrated it’s 30th year of operation in 2013. This core-values relationship empowers CheeZies Pizza® owners to deliver a quality product at an extremely competitive price and expand profit margins by simplifying inventory, minimizing staff, reducing overhead, and streamlining management involvement. *PLEASE NOTE: ALL COSTS LISTED ARE ESTIMATES ONLY, BASED ON PRIOR CHEEZIES PIZZA’S® EXPERIENCE. ACTUAL COSTS WILL VARY, ACCORDING TO MARKET SIZE, GEOGRAPHIC AREA, AND OTHER FACTORS, ALL OF WHICH ARE MORE FULLY DISCLOSED IN AN OFFERING TO BE PROVIDED PRIOR TO THE SALE OF A FRANCHISE. Submit Franchise Request Questions About Financing?